UK General Election Forecast 2015, Who Will Win, Coalition, Conservative or Labour? Recent opinion polls put Labour 6 points ahead of the Conservatives which would translate into Labour winning an general election with a 74 seat majority (Independant on Sunday). Similarly the bookies also have Labour (oddschecker) as hot favourites to win the most seats at the May 2015 general election, though the odds marginally favour another hung parliament, whilst the Conservatives trail a distant third in their chances for an outright election win. However, what the opinion pollsters, bookies and the mainstream media commentators fail to grasp is the likely impact of accelerating UK housing market momentum on an general election that is still 18 months away (May 2015). UK house prices as measured by the Halifax (NSA - November) are now rising at a rate of 8.5% per annum as opposed to falling at a rate of over 2% per annum when I flagged an imminent UK housing multi-year bull market over a year ago. I am continuing to see positive signs towards a multi-year bull market, so I am giving you another head start on an emerging probable multi-year bull market in UK housing. The UK housing bull market momentum continues to gather steam as a series of government measures effectively aimed at engineering an election boom such as expanding and bringing forward the Help to Buy Scheme to October 2013 are acting to ignite bull market fever amongst prospective home buyers. The chancellors announcement of £130 billion mortgage guarantees effectively amounts to seeking to ultimately create a UK version of U.S. Fannie Mae and Freddie Mac that will eventually blow up in spectacular style as more and more house buying voters expect to be bribed at each election and therefore the £130 billion will mushroom to one day stand at well over £1 trillion of liabilities, off course the bust will come AFTER the next housing boom, so this and the next government need not worry themselves for the consequences of creating a UK subprime housing bubble as the consequences of which tax payers will be liable for in a decade or so's time which means another financial crisis as this repeats the SAME mistakes of mortgage backed securities i.e. the lenders are not liable for the risks so can take on more risky loans for commission as the liabilities will be with tax payers. The trend trajectory continues to home in on my forecast expectations for UK house prices to be rising at a rate of more than 12% per annum for January 2014 data, by which time I expect halifax house prices data will likely converge with my forecast trend at that time, and that I expect house prices to average 10% per annum into at least mid 2015 that I will seek to extrapolate beyond the Mid 2014 trend forecast in my next in-depth analysis. In terms of the bull markets current momentum, the UK housing market is accelerating towards an annual inflation rate of at least 10% per annum. Given the markets current trend trajectory, UK house prices could be rising by 10% per annum as early as on release of the Halifax data (NSA) for October 2013 (in November), and continue accelerating to a rate of more than 12% per annum for January 2014 data (released Feb 2014). The bottom line is that the UK bull market is only just getting underway and will likely last the remainder of this decade, yes there will be overbought states when prices run away to more than 20% per annum followed by corrections that see virtually zero or even negative growth for a month or two, but the over-riding trend will be that of a strong bull market, that in terms of momentum will average at least 10% per annum. The effect of housing market momentum is starting to manifest itself economic data as illustrated by accelerating GDP growth that has jumped from 0.3% for Q2 to 0.8% for Q3, resulting in academics recently ramping up their growth expectations for 2014 to 2.5% which in my expectations still significantly under estimates the strength of the UK economy in GDP terms for 2014 and 2015 which my next always free newsletter will next take an in-depth look at. In mid August I explained why housing market sentiment will drive UK economic growth to levels far beyond that which the academics could contemplate at the time. As house price rises continue to accelerate, many people sat on the sidelines waiting for prices to fall or even crash will realise that it is just not going to happen, and in their despair at the relentless accelerating trend of rising prices, in increasing numbers will feel no choice but to jump onboard the housing bull market as a they see the houses they have been viewing sold and asking prices trending ever higher. As house prices rise, home owners see the value of their houses rise £x thousands per month, in many cases by more than their salaries, this will encourage many to borrow and spend more, and save less which will meet the governments primary objective for inflating the economy by means of the housing market. Everyone will be playing the game of how much has my house value increased by, a quick analysis of my own housing portfolio (based in Zoopla estimates) shows a 5.5% increase in housing wealth over just the past 6 months! Does this make me feel richer, more willing to spend? Well, being only human, YES it does! The following graph illustrates the impact of house prices trends on general election results for the past 30 years. The key factors are the trend and strength of housing market momentum during the 2 years in the run up to each general election as being good indicators for the probable outcome in terms of which party will win (government or opposition) and the size of the likely majority. For example for the 1997 general election, despite a strengthening economy UK house prices were still stagnating and showing no signs of breaking out of what was a 6 year slump that they had been revisiting the bottom of the trading range for the preceding 3 years. The result was a huge majority win for Tony Blair's opposition Labour party. The next such negative event for parties in power was in the rum up to the 2010 general election, where despite the housing market coming out of a severe bear market by the time of the general election the trend was still in its embryonic phase so whilst momentum was improving going into the election, however the momentum would only fully manifest itself some 6 months after the May 2010 General election which represented Gordon Browns last screw-up in that he could not even get the timing of the debt fuelled election bounce in house prices right despite increasing Britain's government debt (PSND) by over 40%! 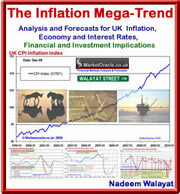 In terms of the 'fixed' May 2015 general election, the implications of 10% per annum house price inflation for another 18 months, that builds on the housing bull market of the previous 12 months and on the embryonic bull market of 2012 are that probability strongly favours an outright Conservative election victory. Labour has already lost the election, the only chance for governing is from within a Coalition with the Liberal Democrats, therefore their strategy will be aimed at fracturing the current coalition and thereby instigating an early general election, the earlier the better for each month that goes by decreases the size of majority that a Coalition government will be able to achieve. Given the lack of manifestation of an ability for the Liberal Democrats to think strategically it remains to be seen if they will be able to read the writing on the wall for the only way the Liberal democrats can survive is by fracturing the current coalition, which for them it's a case of the sooner the better. A fractured coalition triggering an early general election would mean burning the bridges with the Conservatives and thus a Labour / Lib Dem coalition is the only outcome that would deliver the Lib Dems power again. However, as is more probable, should the Liberal Democrats cling on in coalition with the Conservatives then they will likely find themselves out of power in May 2015. The tories need to play things stealthily by downplaying their election prospects and attempting to keep their Lib- Dem coalition partners heavily sedated by bending over backwards to appease them for the Coalition has entered its maximum danger zone time window for breaking apart and delivering a Labour / Lib-Dem Coalition government. So expect the Conservatives to continue to overly friendly towards their coalition colleagues despite increasingly desperate attacks from frightened Liberal Democrat MP's. Therefore the Conservatives strategy is clearly to keep the Coalition government ticking along for as long as possible and they hope all the way into May 2015. Given the various windows of opportunities, therefore at this point in time the ball is clearly in the Liberal Democrats court for the next few months are crucial because if the Coalition government survives into Mid 2014 then there will be an increasing probability for a Conservative outright victory. It is very difficult at this point in time to determine what increasingly desperate Liberal Democrats will choose to do. However given the trend to date of the Coalition having survived thus far, therefore probability favours the coalition continuing all the way into 2015 and thus the Conservatives look set to win the next general election with a small majority of perhaps 30 seats, despite all of the media spin that surrounds the likes of UKIP having destroyed the Tories chances of winning the next election. This analysis is just an excerpt from my current UK housing market in-depth analysis that I aim to complete and email out within the next few days, ensure you are subscribed to my always FREE newsletter to get this analysis detailed concluding trend forecasts in your email in box.